On the 23rd of March 2017, SANEC organised, together with parner organisation NBCC, a conference on the recent geo-political changes and their impact on businesses. 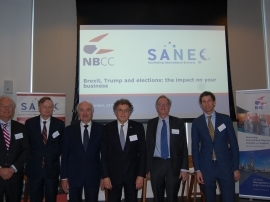 The conference, titled "Brexit, Trump and Elections": The Impact on Your Business, provided some clarity as to what we can learn from it and how businesses can best adapt to it. The conference was kindly hosted by SANEC Board Member Allen & Overy in Amsterdam. More than 70 members of SANEC and NBCC were in attendance. SANEC is grateful to Mr. Alexander Rinnooy Kan for being the keynote speaker at the event. Mr. Rinnooy Kan is a professor in economics and business management at the University of Amsterdam, a Member of the Senate on behalf of the Democrats 66 (D66), His speech was focussed around the recent Dutch elections, with the title of his presentation being "National and International lessons learnt on March 15". The other speakers at the event were Marcel Baartman, Senior Economist at Clingendael whose presentation was titled: "The emerging new world order and its economic consequences", Mr Robert van der Jagt, Chairman of KPMG´s EU Tax Centre who addressed “Dealing with taxes in a changing world” and Mr Gerard Kastelein, Partner at Allen & Overy who delivered his presentation "Brexit from a legal perspective". The formal event was followed by a lively and well attended network reception. We would like to thank our speakers for their great contributions at the event. We would also like to thank all our participants who made this event a great success.